I decided to venture out and catch a WIAA high school basketball game on Friday night, so I made the drive down HWY 41 to Kaukauna to catch the Ghosts home game against FVA rival Appleton East. The Ghosts pretty much controlled the game after Appleton East struggled to shoot the ball well. 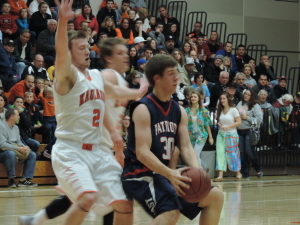 Kaukauna won the game 43-26. What made this night eventful, or perhaps uneventful, was the way the game ended. With about 3 1/2 minutes left in the game and Kaukauna leading by the final margin of 43-26, the Ghosts crossed center court and decided to sit on the clock. They were going to make Appleton East come out and play them or they would simply hold the ball out high. The WIAA Boys basketball sectional semifinals tip-off tonight around the state. I appeared on a google hangout with WSCO Radio’s Justin Hull and Brett Christopherson from the Appleton Post Crescent today. We discussed tonight’s division 3 matchup between top ranked Little Chute and Eastern Valley Conference rival Appleton Xavier. Thanks to Justin Hull for hosting the hangout.